We’ve been busy this week getting the exhibition spruced up for the second round of solo work. Last Sunday saw the legendary David Hurn drop in to get his work on the wall. Thanks to Andrew D. Ward and James W. Foster for catching Mr. Hurn at work. You can see more from them at the exhibition too. So to celebrate all this great new work, we’re opening a little later this Friday to give you a first glimpse. All are welcome between 5pm-7pm this Friday 20th May. Keep up Cardiff football video is live and kicking. We need you to upload video clips via you tube of various moves, tricks and passes from all over the city. Click here to view the INTRO VIDEO. GLC at Big Little City (30/4/11), originally uploaded by DanGreen. 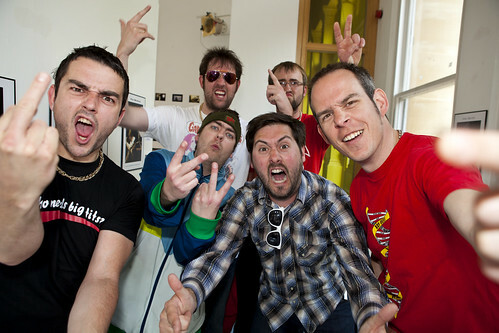 Photo taken after their performance on the Spillers Saturday Sessions stage at the Big Little City exhibition. Report on page 20 of todays Echo. GLC will be performing at the Big Little City project this Saturday (30th April 2011) at 3pm. Ashli Todd from Spillers has put together a storming line up for the next three months starting with the mighty GLC. Part of the GLC crew came to the exhibition yesterday for a nose before their stripped down live performance this Saturday at 3pm. They ll be launching the Spillers Saturday Sessions stage (30/4/11) where a band/musician will play a short acoustic set every Saturday at 3 for FREE. Click here for more the complete line up of the Spillers Saturday Sessions and here for Big Little City info. The Cardiff Story who are looking for more volunteers to staff their (and our) exhibition. Dan has been doing a fantastic job since we opened, but is starting to go a bit strange now, so if you or anyone you know have a few hours to spare we’d really appreciate your help. If you’re interested in helping out, you’ll need to speak to Kate – via email cardiffstory@cardiff.gov.uk or call 029 2078 8334 for more information. There are some details on the The Cardiff Story website. NB For anyone who would be interested in just staffing BigLittleCity, just let Kate know when you get in touch and she will organise your shifts accordingly. Great write-up by Jonathan for the Click on Wales website. Just want to thank all the people who came and contributed to the Big Little City opening night last Thursday. What a special night it was and both Marc Heatley and I were overwhelmed by the amount of people who turned up. Bring on the next fifteen weeks of our time here,with lots of work to be exhibited and the interactive projects are open to all. There will be a glass of wine going (while they last!) and many of the artists who have contributed to the exhibition will be present. Then all off to Cardiff Arts Institute for a well earned drink – should be a good one. Just put a 3D model of the exhibition space together as a reference tool for our artists and thought I’d share them. It’s getting very close to opening now; Dan has started hanging work with the artists already! I’m very excited about all the great work we’ve got to show you, as well as the opportunities for new work to come in via our interactive projects. More on these very soon.